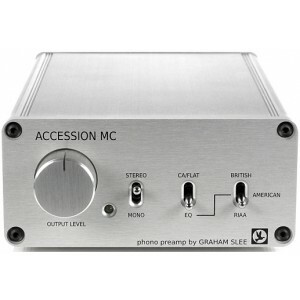 Graham Slee Accession MC is a moving coil phono stage with volume control which enables MC users to enjoy all the benefits of the MM Accession’s unique equalisation system. 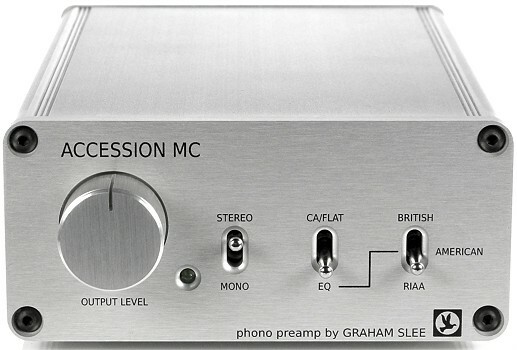 Up until now the Accession phono stage preamp was only available for MM and other high output magnetic cartridges. It is well known that low output moving coil can sound overly bright. It is not that the technology of the cartridge itself is overly bright although there is evidence that cantilever resonance can influence how it sounds at high frequencies. The problem is in the handling and amplification of its signal. With such a low output it is competing with electronic noise for its existence. Interference dwarfs it, and it requires such an incredible amount of gain to bring it up to line-level. The electronic circuit is by necessity high gain, and it also has to be low noise. Both transistors or op-amps minimise distortion but emphasise any slew-rate enhancement leading to the heterodyned high frequency sounds dominating the music. What is needed is a simple local negative feedback stage at the input to lift the signal out of the noise; that has some degeneration which leads to a natural sounding unforced slew-rate; and one that can apply sufficient interference attenuation. This is what the Accession MC does. It meets the conditions laid down in the rules for "fast active" circuitry, which has been a core part of Graham Slee's product design from the very beginning. The "fast-active" noise-level (hiss) is defined as only being noticeable when there is no music playing. It isn't heard below vinyl surface noise and so cannot interfere with the music. The input slew-rate is proportionate to noise and vice-versa. Input slew-rate isn't enhanced slew rate and sounds much more natural (unforced). To get more means accepting just a little more noise, and via the "fast-active" rule, the circuitry operates at a slew-rate which makes the music sound more natural. It provides 4 cartridge loading options: 1) standard 100 Ohms many MC cartridges are specified as, 2) 300 Ohms which is logarithmically (same as our hearing) the double of 100 Ohms, 3) 500 Ohms - the maximum the design can do without compromising noise; and 4) 75 Ohms by selecting both 100 and 300 Ohms. A manual volume control active on the variable "var" outputs which can be used if the Accession MC is to drive a power amp directly. Required power amp input sensitivity will depend on the cartridge output, but a 0.3mV cartridge will cause around 350mV at the variable outputs. Also note this volume control can go fully clockwise without adding distortion to the Accession MC outputs. Adding left and right channels together and dividing by two means mono records played on a stereo cartridge will sound mono, and that's what the Accession mono switch does. Use it to remove the left-right swaying effect a slightly eccentric mono record can have. This A+B/2 switch will not render stereo as true mono, giving a "tunnel" effect to stereo sound so ensure it's switched up when playing stereo records. The shielding provided on the Accession MC safeguards against the intrusion of unwanted electro-magnetic disturbances, which at best would colour the sound and at worst you'd hear interference from other devices. Make sure you use properly shielded interconnects with it so interference hasn't a chance. GS's range of interconnects will help you achieve additional immunity. The eurocard 1U height cases save on space so you can have more things to enjoy without the worry of where to put them. They will stack on top of each other and will even work on their sides. They're remotely powered so won't make other sensitive items hum or buzz. The Accession MC uses and is supplied with PSU1 power supply which should be placed off-rack, keeping transformer influences away from your sensitive equipment, and most importantly well away from your pick-up cartridge. Remote DC power is the most sensible way to power sensitive equipment. There is no transformer inside your Accession MC to worry about, and no AC on its low voltage cord to induce hum into adjacent cables.